“Mushroom Days 2007” opened with films. Luckily for us and other film lovers, there is a cooperation established with the International Short Film Festival called “Kratkofil” from Banjaluka. The contact with “Kratkofil” representatives has been established thanks to our fellow citizen Miodrag Manojlović who won the Festival’s best local film award. There was a presentation of selected films. Boris Čikić, representative of “Kratkofil”, addressed the audience before the film screening. A beautiful morning promised to bring a sunny day and many participants. Around 8 o’clock, students of the “Petar Kočić” elementary school led by their art teacher Željko Vučenović set up an exhibit of mushroom sculptures. There were other remarkable works of art created by the “Milja Đukanović” kindergarten kids who presented their own vision of the mushroom world. New participants, mostly from Banjaluka, Prijedor, Doboj, Sarajevo, Šipovo, Bugojno, Bihać, Belgrade, Split and some of the local people started coming in around 9 o’clock. The media representatives joined us from RTRS, ATV and ŠIK radio. Some time after 10 o’clock over one hundred people of different age (8 months to 76-year-olds), gathered in front of the “Krajina” hotel and started towards Lisina. The Hydro-Power Plant at river Vrbas and Šumsko gazdinstvo „Lisina“ (the public forestry enterprise), and the Mrkonjić Grad Municipality made transport arrangements for 30 persons while others used their own cars. After driving for 15 km we left the vehicles and started walking towards the village called Šibovi – our main destination. as well as a lot of mushrooms for the tasting. There were people like Aleksandar Krapež (Serbian Mycological Society) who knew a lot about nature and were able to transfer their knowledge and many interesting things about nature’s secrets to others. They gladly demonstrated some of these things. 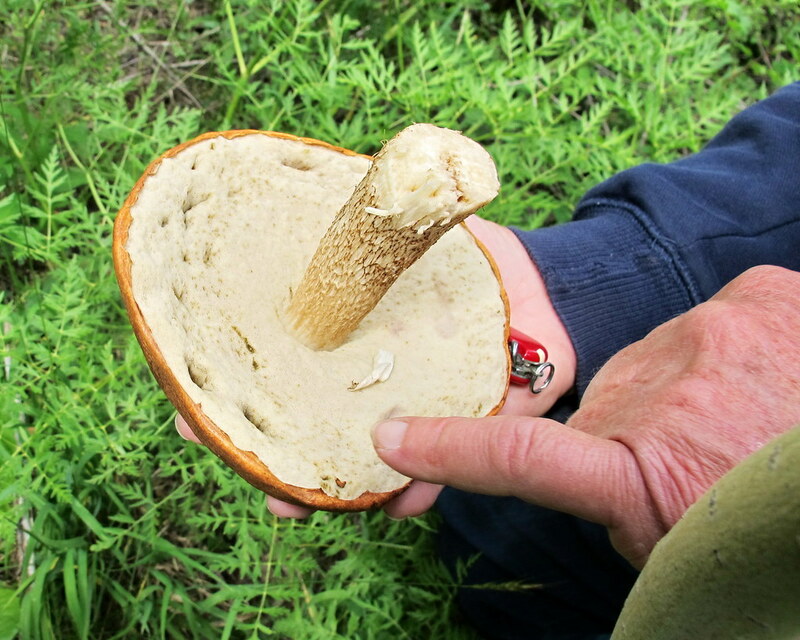 There was a lot of talk about ecological significance of mushrooms and their preservation which resulted in new ideas concerning the mushroom locations and Lisina. Milan Jokić, a wine maker from Banja Luka also spent a day with us and his friends, and he provided some wine and brandy for everybody, while Marinko Rakita from Rovinj brought along some cheese with truffles(!). After a break and group photo shoot we started towards Mrkonjić Grad around 4 o’clock. We were supposed to deliver the mushrooms there by 5 o’clock so Rade Gašić could classify them. After a short stop at Podrašnica and Balkana we came to the hotel in time for dinner. There we were met by “podrašnica table” which consisted of homemade food from Podrašnica that was prepared by the women from the “Naša žena” association. Aside from the delicious meal, the women sang for us so they deserved a double dose of the applause. This was not the end of the day. Rade and Mira stayed in the room to classify the mushrooms, the younger ones who enjoyed loud music stayed up late at the smurf party with Papa Smurf – Nemanja Radić. Some smurfs (Stoja, Mićo, Saša, Radinka, Olivera, Melisa, Lepa) returned to the hotel and took up cleaning the mushrooms for tomorrow’s tasting. It was hard work and we thank them once again for the effort. The kitchen and exhibit room were very much alive during the whole noon. There were numerous preparations from celebratory opening. New guests were arriving, among them the mayor Zoran Tegeltija; deputy mayor Slobodan Ćoćkalo who spent the day earlier with us at Lisina; chairman of the community assembly Divna Aničić; deputy minister from the Environment and Tourism Ministry of the Federal Government Tomislav Lukić etc. The official ceremony began at 12:30. Borislav Marić, the chairman of the mushroom and nature lovers’ association, welcomed the guests and presented certificates of gratitude to the sponsors, mushroom associations, cooperators, guests of honor, and a gift to the youngest mushroom collector Aleksandra Ivanović. After that the municipality mayor opened the mushroom show and an hour later the program continued. There were two brilliant lectures given by Aleksandar Krpeža (topic: Mushrooms as Associates) and Rade Gašić (on poisonous mushrooms). Aside from that, there was a promotion of a book about mushrooms by Mirjana Davidović (Mushrooms – Treasure of our Lands), and an exhibit of the photos taken the day before. At three o’clock everyone gathered around the table with an incredible selections of mushroom dishes (coated or cooked mushrooms, white and black risotto, mushroom filled pancakes, mushroom pies, stew, mushroom filled peppers, salads, and many more…). Only ten minutes later there was practically nothing left!… Two hundred people enjoyed the delicious food prepared by our friends, mothers, wives, … Thank you so much! Our friends from the Umag mushroom association “Boletus” (Vesna and Marino) and the “Našice” association from Našice (Hrvoje) came to see us since they could not come during the weekend. They wanted to see our show, and our nature, Lisina, Balkana, Zelenkovac… Their coming meant a lot to us and once again we would like to thank them for their visit and their contribution to our exhibition show by bringing the rare and highly valued Tuber magnatum (the white truffle) from Istria. We also had a visit from the representatives of the Institute for the protection of cultural heritage of RS who have been working with us for a long time. The exhibition ended in the afternoon. Just one more thing we did was selecting mushrooms for the crew of the Federal TV show called “Zelena panorama” who came for a visit. During the week we received many messages from participants stating their praises for good organization of the event, the great time they had with us, useful things they learned, new friendships etc….